Bradford improved their record to 16-1-1 with wins over South Muskoka and Lefroy this weekend. 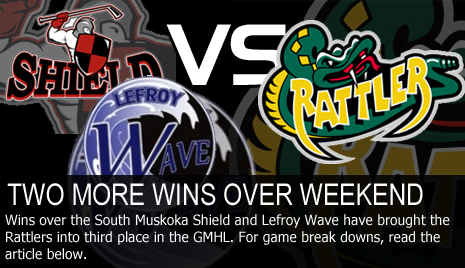 With this, the Rattlers hold third place in the GMHL standings with 35 points. Only Temiscaming and Sturgeon Falls are ahead of Bradford, heading into the second half of the season. On Friday, Bradford’s victories were 5-4 in overtime against the South Muskoka Shield, and they continued their winning ways, downing the Lefroy Wave on Sunday. On November 25th, Bradford traveled down to Gravenhurst, to take on the Lefroy shield. Goalie Rob Sutherland started for Bradford; his first return to his former team since being released earlier this month. The overtime thriller saw Stanislav Nikonov score with 1:30 left in the extra frame, to give Bradford their 15th win of the season. Sutherland recorded 35 Svs on 39 shots, to claim first star of the game honors. Nikonov (1g, 2a) and Conor Smith (1g, 1a) received the second and third stars of the match. Two days later, Bradford was at home again to take on the Lefroy Wave. The much improved Wave squad showed a lot of heart, but ultimately fell 6-4 to the Bradford Rattlers. Carson Bird got the start in net for Bradford, putting up a very solid performance. After one period, the game was close with the Rattlers winning by just 2-1. However, after scoring two unanswered in the second, Bradford never looked back. Goal scorers for Bradford included: Smith (2), Haga, Thommen, Jaffeux, and Maillard. Swiss defender Nicolas Thommen dropped the gloves in the second period of the Lefroy game; facing off against Lefroy’s Tyler Roache. Conor Smith is currently leading your Bradford Rattlers in points following this weekend. The forward from Beijing, China is scoring at a very respectable rate; with 34 points (19g, 15a) in just 18 games this season. The Rattler season continues next weekend with a game against the Bobcaygeon Bucks. Bobcaygeon (3-19-0) is currently 13th in the GMHL regular season standings. This will be the first time these clubs face off this season.